Never touch a power line with any part of your body or any object. 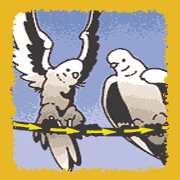 Have you ever wondered why the birds that sit on power lines don't get electric shocks? It's because the electricity is always looking for a way to get to the ground, but the birds are not touching the ground or anything in contact with the ground. Have you ever wondered why people who work up on power lines don't get shocked? 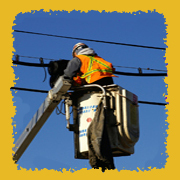 Utility workers are trained to work with electricity. They wear special insulated boots, hardhats, and gloves, and use special insulated tools that help prevent shock.